Biocell Collagen is supported by multiple human trials. Herba’s original BioCell Collagen II®is a natural hydrolyzed Type II collagen in a complex matrix of other elements such as chondroitin sulfate and hyaluronic acid that promotes active joints and youthful looking skin. BioCell Collagen II was developed as a low molecular weight ingredient that could be easily absorbed by the body. BioCell Collagen is a multi-patented, scientifically-substantiated ingredient that promotes active joints, youthful looking skin, and healthy connective tissues. The synergistic effect of hydrolyzed collagen, low molecular weight (LMW) hyaluronic acid and chondroitin sulfate offers a multi-dimensional nutritional support for maintaining healthy connective tissues such as joint and skin. What is expected benefits from Herba’s original BioCell Collagen II®? 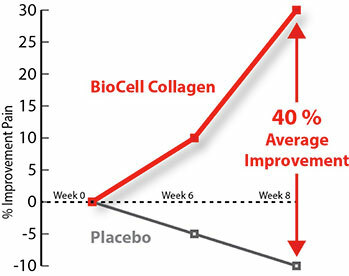 *Disclaimer: Biocell collagen supplementation 1g per day for 12 weeks. Results not typical, individual results may vary. **Disclaimer: Biocell collagen supplementation in conjunction with facial exercises. Results not typical, individual results may vary. 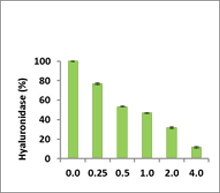 Hyaluronic Acid (HA)in Biocell plays an essential role in skin hydration by retaining water in the dermis. BioCell Collagen helps maintain healthy levels of HA not only by elevating HA levels in the bloodstream but by inhibiting HA degradation. ■This trial enrolled 89 subjects who were experiencing pain caused by joint discomfort. 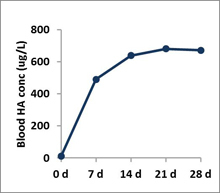 ■The subjects ingested 2 grams daily of BioCell Collagen for 45 days.